History books seem to be popping up in bookshops left, right and centre this year with the anniversary of the 1916 Rising quickly approaching. However, this Limerick writer has decided to publish something a little bit different. 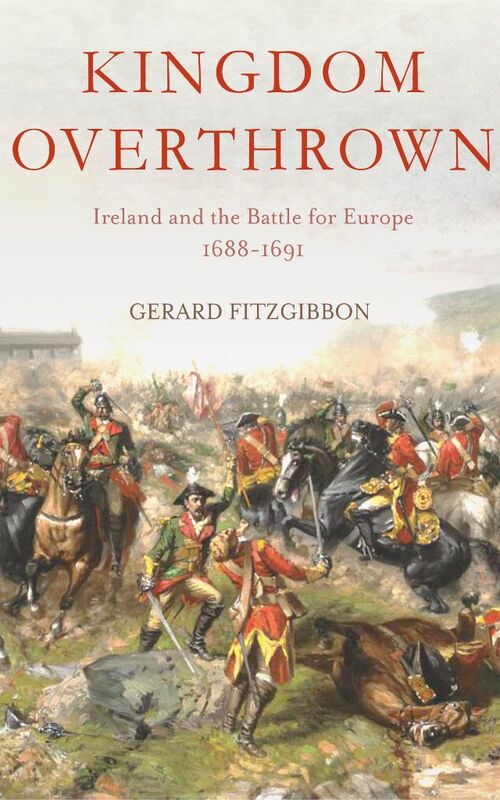 After studying history in the University of Limerick, Gerard Fitzgibbon has recently released his first ever book. Kingdom Overthrown: Ireland and the Battle for Europe 1688-1691 tells the story of the Williamite War which resulted in The Siege of Limerick and the Treaty of Limerick. This book is an essential for any history buff, especially those interested in the history of Limerick. Before the release of Kingdom Overthrown, Gerard Fitzgibbon was a reporter for the Limerick Leader and won Irish Young Journalist of the Year in 2009. The time he has spent in Limerick has had a very clear effect on his work. We decided to ask him more about his upbringing in Limerick as well as Kingdom Overthrown and his plans for future books. How does it feel to finally have your first book published? It’s strange. I was very lucky that New Island Books jumped aboard quite early, which meant that I didn’t have to spend months looking for someone to publish it. That freed me up to get cracking on it. Sifting through sources, putting together drafts, working through re-writes with my editor – it’s like building a house. You dig foundations, slowly lay the blocks, and do a million tiny jobs that no one else can see. At the end, you have something amazing. But as a writer it’s hard to stand back and admire it. It’s a strange feeling to walk into O’Mahony’s or Easons and see my name up on the shelf next to titans like Norman Davies and Roger Crowley, men whose books I cherish. I still don’t think it’s sunk in. It’s quite weird. Can you tell us a little bit about your book, Kingdom Overthrown? It’s a narrative account of the Williamite War in Ireland, a fascinating and gruesome period in Irish history which has been largely swept under the bed. Most people are vaguely familiar with the war’s great set pieces – the Siege of Derry, the Battle of the Boyne, the Sieges of Athlone and Limerick, the Battle of Aughrim. There are several excellent academic studies of this war, its origins and its consequences. But none of them try to bring the episode to life, with eye witness accounts and that brutal sense of death and life. I’ve presented it as a story, almost a non-fiction novel, based on facts and research but told in colour. How did the Williamite War affect Limerick? So much of how Limerick perceives itself today is rooted in this period. The coat of arms, the city motto, the defiant chip on its shoulder. I spent almost a decade living and working in Limerick city, and it’s impossible not to catch a whiff of it. During the war, the Jacobites were twice forced to retreat to Limerick to make their final stand. In the midst of all this is where we see the emergence of Patrick Sarsfield, who’s became a sort of crude patron saint for Limerick. Sarsfield was a stupidly brave officer from Dublin who was never happy unless there was shrapnel flying past his ears. He was also one of the most divisive men of his time. Limerick’s history is a patchwork quilt of myths, legends and stone, and so much of it is traced back to this war. What is it about the Williamite War that particularly interests you? I’ve always been fascinated by the early modern period, those few hundred years when the lid was peeled off the medieval world and something ferocious was revealed. The Fall of Constantinople, the Reformation, gunpowder, international commerce, the Renaissance, the Sieges of Vienna – the world was constantly shifting and twisting, trying to take form. The Williamite War is odd because it was like one of those Russian matryoshka dolls, a war within a war within a war. For the Irish volunteer soldiers – Protestant and Catholic alike – it was a civil war soaked in religious hatred. For the Catholic officers and aristocrats, it was a fight to re-take the land and prestige that they had been losing for over a century. For James II and William of Orange, the great figureheads of each army, it was a fight for the throne. And for Louis XIV of France, the invisible hand guiding the entire conflict, it was a useful new frontier in a great continental struggle. The whole thing is captivating, bizarre and bloody. How did you go about researching it? I wanted to lean almost entirely on primary sources like letters and diaries, because that’s where the meat is. There is no better version of history than the one seen through someone’s eyes. That brings its own challenges, of course, because people always tint things with their own bias, particularly in such a hateful age as the 17th century. But the deeper you dig and the more you discover, the better chance you have of building a balanced narrative. For my research, I was in and out of the Limerick and Cork city libraries, with a few trips up to the National Library in Dublin too. But luckily many manuscript collections, pamphlets, parliamentary records and other sources are available online these days. It’s excellent, and I only hope that this makes it easier for others to start researching this period as well. How do you think that studying history in University of Limerick has influenced your work? UL has an excellent history department. More than anything, the lecturers and tutors have a passion for what they’re doing, and it shows. When I was there I was lucky enough to study under Dr Padraig Lenihan, who’s now at NUI Galway. Dr Leinhan is probably our finest scholar of 17th century Ireland, and he has written and edited some terrific studies of the period. He also has that helpful knack for giving colourful, engaging lectures that stay with you. You previously worked as a reporter and you won Irish Young Journalist of the Year in 2009. What made you want to stop working in journalism? There was no one reason to be honest. I spent six great years at the Limerick Leader, and worked with some of the finest, most committed men and women I’ve ever known. The editor, Alan English, took me under his wing and I wouldn’t have achieved what I did without him as my mentor. But history has always been my first love, and my desire to write this book had been gnawing away at me for some time. I was coming up hard on my thirtieth birthday, and I feared that if I didn’t take the leap now, the book would never make it into ink. So I closed my eyes and jumped. I’m delighted that I did. Do you have any plans to publish more books in the future? Definitely. I’ve a few ideas for my next project, but I’m happy to let them brew for another while. I’m very proud of Kingdom Overthrown, and even though it’s only been out for a little while I’ve been overwhelmed by the positive feedback and reviews it’s received. Last month a reader contacted my publisher to tell them how much they loved the book, and bought a second copy specifically so I could sign it. You can measure success or failure a thousand ways, but for a first time author fumbling their way into a new career, things like that are the most rewarding of all. Kingdom Overthrown: Ireland and the Battle for Europe 1688 – 1691 is available now in bookshops nationwide as well as from www.newisland.ie.